Although Minamoto no Yoshitsune distinguished himself in the overthrow of the Heike Clan, his elder brother, Minamoto no Yoritomo, refused to receive him in Kamakura and grounded him to his mansion in Horikawa, Kyoto. One day, Tosanobō Shōzon, one of Yoritomo’s subordinates, arrives in Kyoto from Kamakura. Since Yoshitsune believes that Shōzon came to kill him, he orders his subordinate, Benkei, to bring Shōzon to him. When Yoshitsune asks Shōzon if he has come to assassinate Yoshitsune, Shōzon replies that he is stopping in Kyoto on his way as a pilgrim to Kumano. He then improvises an oath to the gods as proof of his words. Although Yoshitsune is aware that Shōzon is lying, he is highly impressed by the contents of the improvised oath and therefore holds a party for Shōzon. After entertaining and feeding him well with dances by Lady Shizuka, Yoshitsune sends Shōzon back to his lodge. Benkei dispatches a woman to spy on Shōzon at his lodge. Shōzon and his group are busy preparing weapons, horses, and warriors to attack Yoshitsune’s mansion. Knowing these facts, Yoshitsune prepares himself and with Benkei and other subordinates by his side, waits for them to attack. Yoshitsune takes on Shōzon’s troop. After harsh battle, Yoshitsune captures Shōzon. This piece of genzai-noh (Noh depicting contemporary events), “Shōzon,” is based on a historic event, as Tosanobō Shōzon was indeed killed by Minamoto no Yoshitsune. Exciting scenes and great chanting are the distinguishing features that make this piece dramatic. As with “Ataka” and “Eboshiori,” the appearance of many performers on the stage makes this drama powerful. The highlight of the first half is the scene in which shite (Shōzon or Benkei) reads the oath, or Kishōmon. 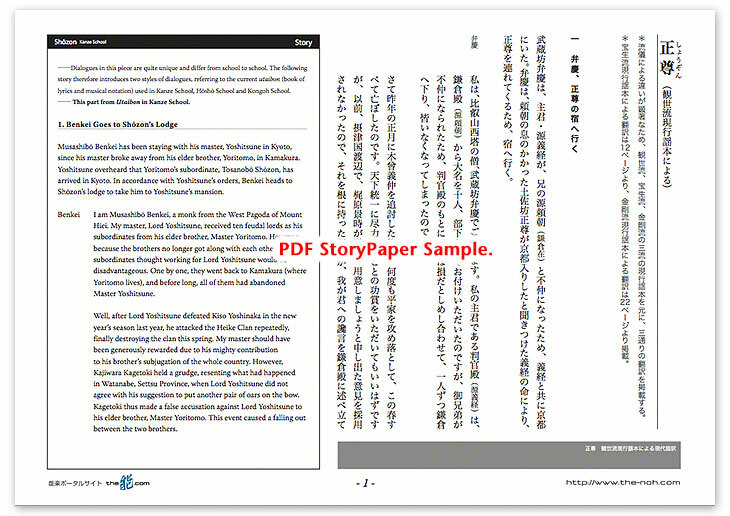 The Kishōmon is a document detailing one’s vows to the gods. The chanting of Kishōmon in “Shōzon” is called one of the “Three Readings” (San-Yomimono), the other two being Kanjinchō in “Ataka” and Gansho in “Kiso,” which are considered to be advanced-level performances that require special permission to perform. The Kishōmon oath that Shōzon improvised in the moment is so well written that Yoshitsune is deeply moved by it. Greatly impressed with his talent, Yoshitsune holds a feast for Shōzon and entertains him with drink and dancing by Lady Shizuka, instead of capturing and killing him, even though he is aware that Shōzon intends to kill him. A sense of urgency, expressed through dialogue and chanting, describes Shōzon’s talent and Yoshitsune’s heart that cherishes that talent. Unlike the first half of the play, a dynamic battle scene is the highlight of the second half featuring the troops of Yoshitsune and Shōzon. Several warriors from both sides randomly spar on stage. They display various fighting techniques, creating a very enjoyable, impressive spectacle. 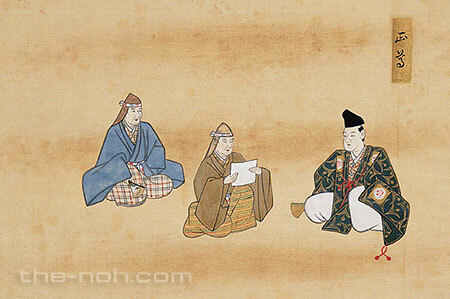 In the Kanze, Hōshō, and Kita schools, Shōzon is the lead character who reads the Kishōmon, while in the Komparu and Kongoh schools, Benkei is the lead and receives and reads the Kishōmon written by Shōzon (tsure).